In most cases, the things we want to pursue can be started by using what we already have on hand. Instead of rushing to the nearest store to get a fancy DSLR camera to try photography, we can do it with our phone camera. Crochet requires only hook and wool. There are good chances that you already have a pair of walking/running shoes at home. Many building apartments come with gym and swimming pool facilities these days. You can start baking with your Mom's hand held beater, bowl and a baking tin. Starting a Yoga practice only requires a mat/rug - I would suggest taking lessons personally from a Yoga teacher than YouTube though. Writing only needs pen and paper. You catch my drift. When people ask me what props to purchase for food photography, I tell them use what you have at home. 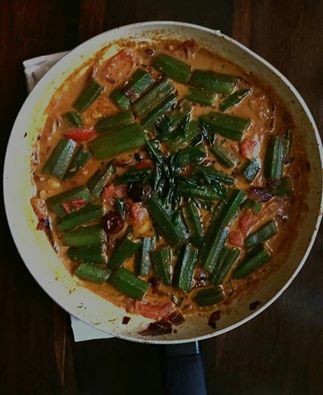 The photo of this lady finger curry was taken in the ceramic pan I cooked it in, on top of the 2 dirham Ikea tea towel above my dining chair. The lighting was not great as I took the photo at noon, so I did some editing on Instagram and called it done. More than the photo, it was the story behind it that was important to me (I was reminiscing about my Mom's lady finger curry and how I am never able to recreate it). To my pleasant surprise, this simple photo caught the attention of many on Instagram! By starting your craft using what you already have on hand you will also give yourself time to see whether your passion truly lies in it and whether it is something you want to pursue long term. So, what's lying around your house?